I couldn’t be more pleased with the website from Next Line Designs has created for me. The service is very professional at all times and the responses are quick. 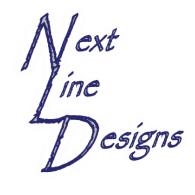 I would highly recommend Next Line Designs for providing a highly professional ongoing service with very impressive response time and excellent advice and support. exceptional job in developing our website." We have always had a timely response and a satisfactory job from Next Line Design. I will recommend them to anybody for website jobs. board, he has upgrade our product to an excellent web experience." Todd Huebner, Blueline Club treasurer. "I had Next Line Designs build and manage my website, design my business cards and brochures. They did an awesome job and I know they'll do a great job for everyone that they work with." "Working with Next Line Designs was easy. What could have been a tense experience was very relaxed. When I viewed the video and suggested changes in the editing, my suggestions were taken seriously and I am very satisfied with the final product."